Surface-hardened technical woven wool is what VOORMI/Fishpond (Co-lab) calls the stuff used to make their hoodies. I normally try to dispense with the tech talk when covering clothing, mainly because that information is readily available on company websites – but this hoodie is very different. 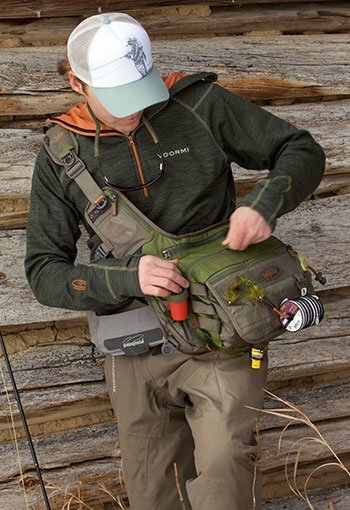 Thinner, less bulky waterproof outerwear is what Voormi/Fishpond Co-Lab were after. They did this by replacing weatherproof shells and conventional layering systems in favor of one single layer that has multiple, customizable properties—wicking and waterproofing, or insulation and windproofing—all the while producing a breathable textile with only a single layer of material – a significant advancement in outdoor clothing. Membranes—which can be waterproof or windproof—are the core of outdoor clothing, and Voormi’s new technology still uses them. What’s different is how the membrane is applied. Independently, membranes are feeble components, so textile companies are obliged to laminate membranes to outer shells of varying compositions. Often an internal liner is then added to further improve durability. All of that makes a functional piece of clothing, that may also have significant weight and volume due to the multiple layers of fabric, the laminate adhesive, and the seam tape needed to cover stitch holes. Also, all the layers can impede the membrane’s breathability, making it less effective. Voormi’s new technique revises how these layers are combined. Instead of pairing a membrane to a fabric (via stitching or adhesive), the membrane is placed into a machine that knits a yarn in, around and through the membrane. This technique interlaces nylon fibers on the outer facing surface of the fabric. On the inside of the garment (during the same knitting process), they introduce fleeced high performance wicking fibers to provide insulation and moisture management. Finally, the outer surface is treated with a wool-specific water repellent treatment. Punching thousands of thread holes turn the membrane into net, all of which sounds counter intuitive, but this is where the company actually demonstrates their competitive edge, by reconstituting the integrity of the membrane after the knitting process. Also, advanced wool carding and combing aligns the wool to ensure that the longest fibers make it to spinning. The result is a smoother, non-scratchy yarn. The (trademarked) product resulting from this process is called surface-hardened thermal wool, it’s a durable 21.5-micron wool re-enforced by an array of outer facing high strength fibers, finished off with a durable water repellent coating. The end result is a single-layer textile with a (membrane) core that’s constructed in the process, and as a stand-alone layer, it means more ability for much-needed air to flush through the fabric. I tested the hoodie both with and without a T-shirt and can confirm that it performs well in common wet/cold conditions: next-to-skin is akin to wearing a sweatshirt as opposed to an itchy wool sweater – so top marks on that front. Tailoring is very close to the body (athletic fit), something to consider when sizing for wear. The end result is an all-in-one unit that offers protection from water and wind as well as excellent heat regulation and retention. Final note: durable fibers are integrated to improve abrasion resistance on the outside of the garment, which is a great benefit when trekking through dense wooded areas – no worries about snagging. This wool product is machine washable. Voormi makes all of its clothing in the US from exclusively US-sourced materials, down to the sheep that produce the wool.